The deadline for both congressional and state legislative district plans is at the first legislative session following the population count by the United States Census Bureau. The legislature is responsible for redistricting. A joint, ad-hoc committee is usually appointed. The governor has veto power over both congressional and state legislative district plans. Public hearings were recently held around the state that gave citizens the opportunity to present testimony. The legislature also has a redistricting website where citizens can make comments , view maps, and view transcripts of the meetings. The special geography of Utah has created ongoing intraparty conflicts against urban and rural interests. 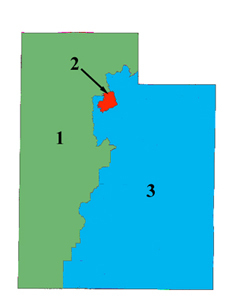 80% of the state's population is concentrated in a four county area called the "Wasatch Front,” next to the Wasatch mountain range. This heavy population concentration often requires districts to be drawn with both urban and rural characteristics. Rural interests fear that being included in districts with urban populations will jeopardize their political clout in the legislature. With Republicans in firm control of redistricting in 2001, they likely will seek a plan that will restore a Republican monopoly of the state's three U.S. House seats.